We all know that frequency of accident happenings around the word increase too much. One of the common news that we see or read is about people who unfortunately, fall victims of accidents. A Personal Accident Insurance offers you the financial security you want to give your family in case of any miss happening occurs. Accidents can occur unexpectedly at any place, they may causes disability or death. 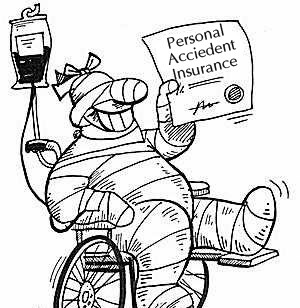 To compensate for the same, Personal Accident Insurance is a best answer. A Term Insurance Plan can only help in case of death and a health insurance plan can help in case your hospitalization, these insurance policies are not as comprehensive as compare to Personal Accident Insurance policies. Generally people think if they have life insurance and health insurance than there is no need of all other insurance policies. Personal Accident plan is very much different from life insurance plan, like personal accident plan covers medical expenses due to accident but life insurance plan doesn’t. Personal accident insurance premiums vary with the policy holder’s occupation while in case of life insurance premium vary with the policyholder’s age, which means if you are 28 years old or 55 years old, the premium would be the same and no medical examination is required to enroll in the personal accident insurance plan. Bajajcapitalinsurance.com provides you a comprehensive online insurance platform to compare and buy best insurance policies offered by leading insurance companies in India.